Gary's Lawn Solutions have been providing lawn aeration packages, sprinkler startup packages, and all phases of sprinkler repair in Colorado Springs CO, Aurora CO, Castle Rock CO, Centennial CO, Highlands Ranch CO, Lone Tree CO, Parker CO, and surrounding areas for over 20 years. 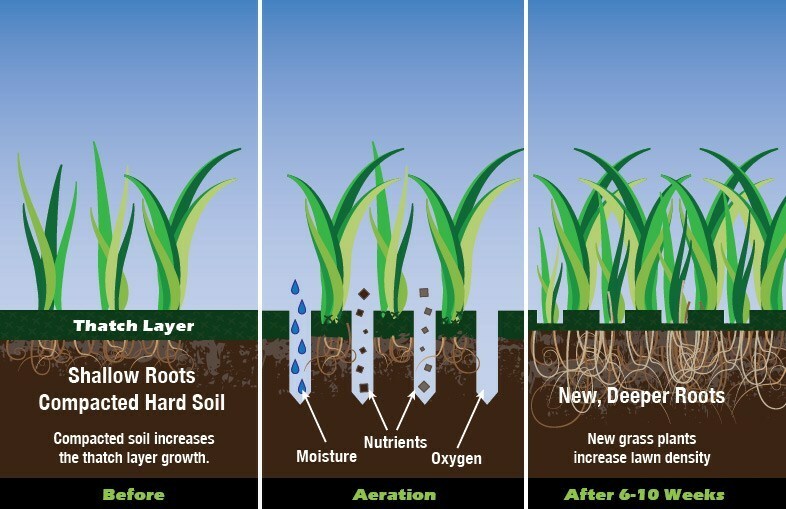 Lawn aeration is a process which mechanically opens the turf. Lawn aeration machines penetrate the soil and provide the space needed for roots to grow. When roots are compacted and do not have enough space to grow, the lawn will stop growing. Spring lawn aeration is the best-known practice to keep your lawn green, healthy, and problem free. Throughout the cold and dry winter months, your lawn is in its dormant stage. Roots have been deprived of water and nutrients. Spring lawn aeration will allow water, fertilizer, oxygen, and all other important nutrients to soak into the soil and stimulate new root growth. Most importantly, roots will have the needed room to grow for the lawn to flourish. Our extensive "Double" lawn aeration packages include overlapping your lawn a minimum of 2-3 times. Extra fertilizer, extra water, and all other important nutrients will soak in and feed your lawn properly. If your lawn needs extra attention in thinning areas or dead patches, we will attend to these areas as much as necessary. Our goals are to improve the health and quality of your lawn. We don't charge any additional fees to complete the job right! Better Fertilizers = Greener and Healthier Lawn! All our fertilizers are commercial grade products commonly applied to community parks, public schools, commercial properties, and golf courses. Our fertilizers are manufactured and blended here in Colorado to perfectly balance the Ph in the soil. Applying the correct and proper amount of top quality fertilizers will keep your lawn green, and healthy. What is the Best Seed Type for Your Lawn? Our Kentucky Bluegrass seed is a commercial grade, top-of-the-line blend, commonly applied on parks, commercial properties, and golf courses. Our seed type is durable, drought tolerant, easy to maintain and designed to last. Our Kentucky Bluegrass seed type will keep your lawn looking great! Our commercial grade weed & feed fertilizer prevents weeds before they begin to grow! Our weed & feed fertilizer destroys weeds such as dandelions, thistle, and other broadleaf weeds while fertilizing the lawn simultaneously. Our commercial grade weed & feed is most beneficial when applied immediately after lawn aeration has been performed as it will be able to soak into the soil at a much quicker rate before the weeds begin to spread. Our sprinkler startup service is performed by licensed plumbers with 20 plus years of hands-on experience. Our sprinkler startup process protects your system from unnecessary damage during the activation process. Starting up your sprinkler system correctly is the difference between a smooth running system or expensive and possibly preventable repair bills. Our licensed plumbers have 20 plus years of technical knowledge resolving every type of sprinkler repair issue. We only use state-of-the-art, commercial-grade parts and our workmanship is top notch! We stand behind our work and warranty all parts and labor. We explain what measures to take to prevent any unnecessary sprinkler repair issues. ​ 1)Turning the sprinkler system on in March or April and the temperature drops after being pressurized. 2) Not blowing out and winterizing the sprinkler system or performing the winterizing process incorrectly. 3) Hiring inexperienced and/or non-licensed sprinkler repair companies. Colorado Springs CO, Aurora CO, Castle Rock CO, Centennial CO, Highlands Ranch CO, Lone Tree CO, Parker CO, and surrounding areas!